This free loan payment calculator for Windows allows you to quickly calculate loan payments based upon variable payment frequency! Offers Daily 365/year, Daily 360/year, Weekly, Biweekly 26/year, Bimonthly 24/year, Monthly, Quarterly, Biannual, and Annual payment periods. 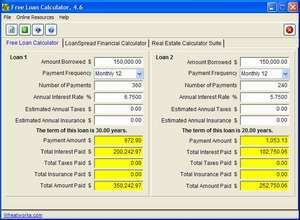 Free Loan Calculator provides you the ability to compare two loans side-by-side and calculates Principal, Interest, Taxes and Insurance (PITI). For security reasons, you should also check out the Free Loan Calculator download at LO4D.com which includes virus and malware tests. Additional screenshots of this application download may be available, too. 3.69 out of 5 based on 13 ratings.